A colourful riot of 1980s nostalgia! Carrie Hope Fletcher in "Heathers"
Les Miz alumna Carrie Hope Fletcher spent much of the summer headlining an in-town production of Heathers: The Musical that wasn’t open to the press: a somewhat-tweaked version of the same staging has now got a commercial upgrade to the Theatre Royal Haymarket and is in previews prior to opening on September 13. The charming and hugely self-aware Fletcher joined Broadway.com in conversation to discuss one of the fall’s most eagerly awaited musicals. How did you first hear about this stage musical adaptation of the 1988 film Heathers [which ran off-Broadway in 2014]? I actually discovered the show when I was in Les Miz. Rob Houchen, who was playing Marius, sent me some of the songs and said, “We have to cover these.” From that moment on, I became a little bit obsessed! It became a case of following the show and downloading the album and just loving it. Did you set your sights then on playing Veronica Sawyer in London? I had heard that Heathers was coming to the U.K. and was asked whether I would be interested in auditioning, and I thought, “Absolutely; that’s a complete no-brainer. Did you even have to ask that question?” The creative team were all from the States so [the casting] was done transatlantically: four rounds of tapes later, I got the call saying I had the role. It was a dream come true. Given your following [Fletcher has a popular YouTube channel], did you really have to audition? I think I’d be suspicious if I didn’t have to audition! If that were to happen, I would only then be cast for what people have seen online rather than whether I’m right for the role. I’ve found during the times when I’ve gone through several rounds of auditions that they have really taken pains to consider me, and that makes an enormous difference. Was it hard during rehearsals to discard thoughts of the Winona Ryder film? On our first day of rehearsals, we actually sat down and watched the movie as a cast: Dan Waters wrote the movie and is still involved with Heathers, so we got to meet him! We got to meet the man who invented these characters and these stories. Did it feel at that point as if you were entering a Heathers “family,” so to speak? Absolutely. 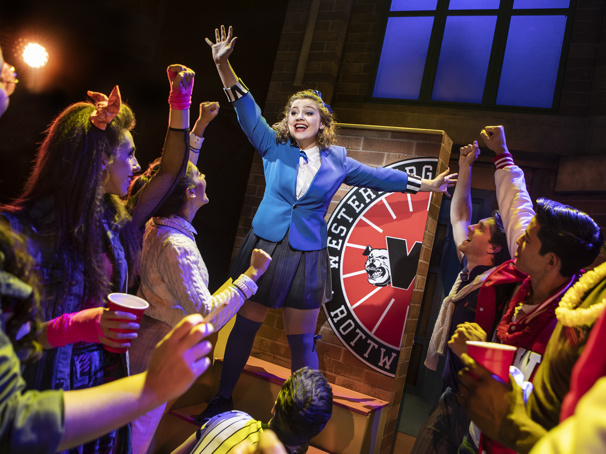 We’ve had video messages from almost the entire cast from the L.A. workshop and the off-Broadway production, and it has become very apparent that Heathers is a big family. Once you’re part of that family, you never leave. Aren’t you used to that after played Eponine in Les Miz? How does it feel in the case of both shows—Les Miz and now Heathers—to be taking on such time-tested material? In both cases it feels as if you’re signing on for the package deal because people love these titles so much, and both shows have the most dedicated and passionate fan base. I’ve definitely witnessed that at Heathers, which feels less like performing a musical and more like a rock concert every night. People really relate to the story; it comes with such an uplifting and hopeful message. Do you feel onstage what I felt the night I went—namely, how quiet and attentive this show’s fan base is in between their very vocal enthusiasm? Yes, and that comes, I think, from admiring it. They love the show so much that they just want to see it: they want to hear the next bit, especially when they’re watching a slightly different production from anything they have seen before. We have new songs and new set pieces and the script has been rewritten and refined, so it’s not necessarily what they already know. How have you handled the legacy of Barrett Wilbert Weed, who originated the part off-Broadway? I’m 25 playing a 17-year-old but I’m playing her with the hindsight of how it felt to be 17, and that is bound to be different from how Barrett felt when she was 17: so, there’s instantly a whole different relationship between myself and the character and Barrett and the character based on how we each felt when we were 17. Since that New York production, the creative team has also had a few years to come away and refine how the thing should work, so where we have got to now just feels like part and parcel of a show that has been developing and evolving over the years. What are you finding especially rewarding about the role? I’m enjoying the slightly dorky side of Veronica, which I think makes her a lot more vulnerable and easier to manipulate; it gives her more of a story arc. Do you, as an Englishwoman, feel that the story being told is very American? The characters all feel very familiar to me. There’s no difference whatsoever when it comes to talking about cliques in school and how everyone interacts. I definitely had Heathers at my school and Marthas and Rams and geeks [all characters in the show]. I’m sure it helps that my generation grew up watching American TV shows, so really none of this seems out of the ordinary. Away from the show, how do you sustain your huge online presence while also writing novels? I’m getting better with the demands of online. When I started, YouTube had only been around over a decade, which is just seconds in the grand scheme of things. I used to be terrible at understanding what the boundaries are and where YouTube ended. You can feel exposed online with literally the entire world watching you, but it is an amazing platform. And where do the books fit into all this? Given all you have accomplished, what do you wish that you could say from where you are now to your 17-year-old self? I wish I was 17 with all the knowledge I have now—and I also wish that I had had this musical when I was 17! I would have felt a bit more understood and a lot less alone. Are you moved nightly by the outpouring of affection for you, and for the show, during the curtain call? It’s amazing at the end of the show to look out and see groups of 17-year-olds all dressed in the colors of the Heathers clutching each other and crying. I just hope they go away and feel less alone, which is always the dream with shows like this: if you can change one person’s life or one person’s mind. Barrett Wilbert Weed, as you know, has since graduated to the Broadway production of Mean Girls: is that title on your London radar? I don’t know. I feel like I’m a Heather through and through.